Catalonia has its own language, distinct culture, appealing architecture and proud traditions. Look for a bullfight and you’ll be disappointed. There’s no Flamenco dancing either but there’s plenty of quality golf to be experienced. The concentration of courses isn’t as high as in southern Spain, but there are some belters around the Costa Brava. Golf Platja de Pals has hosted four European Tour events and is the oldest course in the area. Just as the opening bars of an overture set the tone for what is to follow, so the 1st hole gives the golfer a clear clue as to what sort of course this is – tight and tree-lined. The impressive 100-year-old umbrella pines alongside the fairways provide a menacing presence that is sufficiently threatening to unhinge the hesitant. Under the same ownership and about 15 minutes away is the sister course, Golf Serres de Pals. Surrounded by open agricultural land and close to the medieval town of Pals, it has welcomed European Tour Qualifying School and is almost three courses in one with three distinct sections – open hilly, tight woodland and lovely lakes. Emporda completes the Costa Brava’s ‘Golden Golf Triangle’. Opened in 1990, it has steadily expanded and now offers four sets of nine that together make up 36 fabulous golf holes. Although colour coded into blue, gold, green and red nines, in reality the 36 can most easily be divided into two – wooded and links-like. 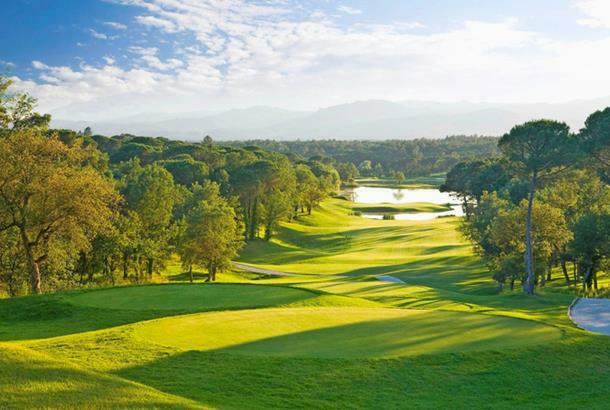 But the undoubted jewel in Costa Brava’s crown is PGA Catalunya. There are two courses. Designed by Neil Coles and Angel Gallardo, the Stadium was originally conceived as a possible Ryder Cup venue. Had planning and construction issues not hindered initial progress and delayed the opening until 1999, it, rather than Valderrama, might have hosted the 1997 match. Never mind, although it missed out on the ‘Big One’, the Spanish Open was played here in 2002 and 2009 and, partly because of its association with the European Tour, it’s also a regular Qualifying School venue. Carved through pine forests with lush and rolling fairways it’s an absolute cracker as is the Tour course nextdoor. Along the coast, summers are dry and hot with sea breezes and a maximum temperature of around 30°C. Winters are cool or slightly cold with spring and autumn typically the rainiest seasons. Inland is hotter and drier in summer – up to 35°C or even 40°C – and it’s very much colder than the coast in winter. There are dozens of outstanding restaurants in the area; seafood is the connoisseur’s choice and there are enough great local wines to keep you cheerful even after the most disappointing round. Add a touch of history, glorious scenery, especially in the foothills of the Pyrenees, and the truly beautiful city of Barcelona and you can see why Catalonia is growing in popularity as a destination for golfers. Between them Ryanair, easyJet, BA and Monarch fly to either Barcelona El Prat or Girona-Costa Brava from London and most UK regional airports.